At the core of the ISO 55000 asset management standard is the concept that assets exist to generate value for the company and its stakeholders. To maximize business value, organizations must develop comprehensive plans to proactively manage risk and ensure the ongoing performance and reliability of critical infrastructure. 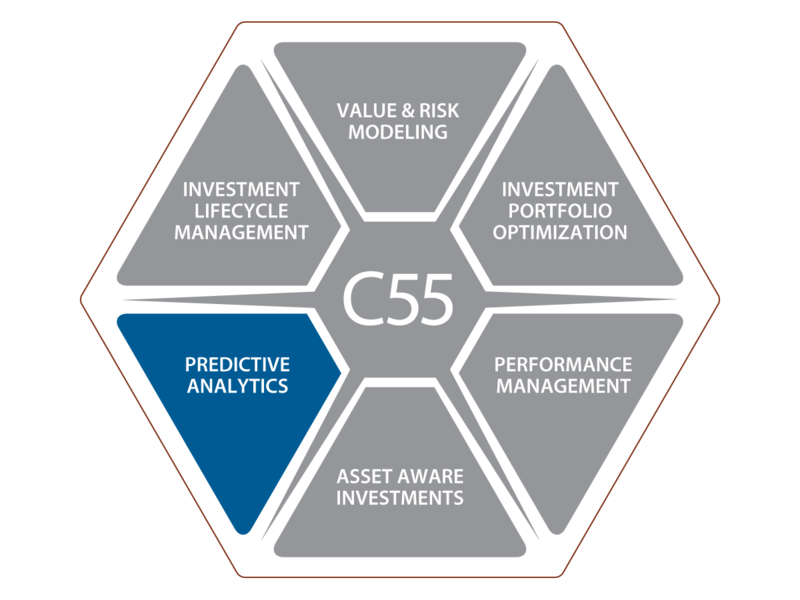 The Copperleaf™ C55 Predictive Analytics module empowers companies to understand their asset sustainment needs over the long term, and create an investment strategy that maximizes business value while proactively managing risk. Many asset-intensive organizations struggle to forecast sustainment needs across diverse asset pools. C55 provides a long-term view by determining the optimal economic intervention dates for every unique asset, based on its age, condition, degradation, and risk profile. C55 considers the total cost of operating, maintaining, refurbishing and replacing the asset, as well as the risks associated with potential failures, throughout its entire lifecycle. Large populations of assets with relatively low individual cost, such as distribution poles or sewer pipes, require special attention. Rather than addressing these assets individually, companies design recurring programs blending proactive and reactive investment to manage risk across the asset pool. However, the business consequences of reducing or increasing the level of investment in these programs is not well understood. With C55, you can easily compare the risk, benefits and cost trade-offs of various levels of funding to identify the optimal investment strategy. With Copperleaf C55, we now have much better visibility into the sustainment needs of our asset base over the long term, and we can clearly demonstrate that our investment plans are aligned with our company priorities. C55 is highly modular and configurable, growing with you as your business needs evolve. 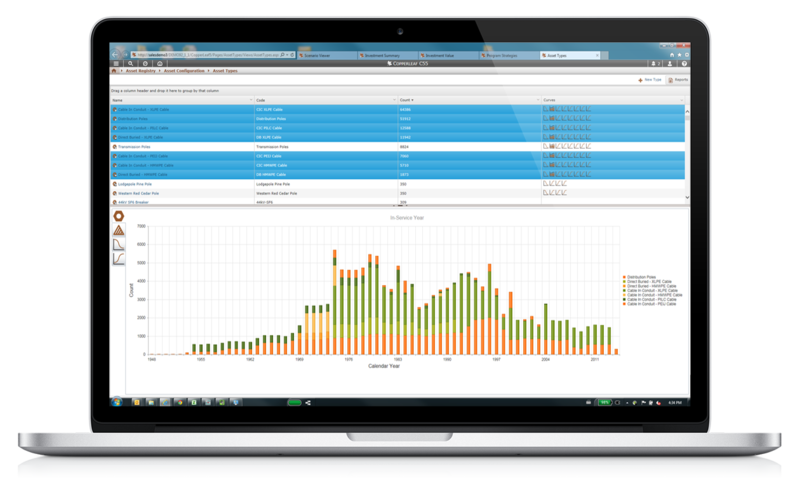 It can integrate seamlessly with your existing systems to turn data into decisions. 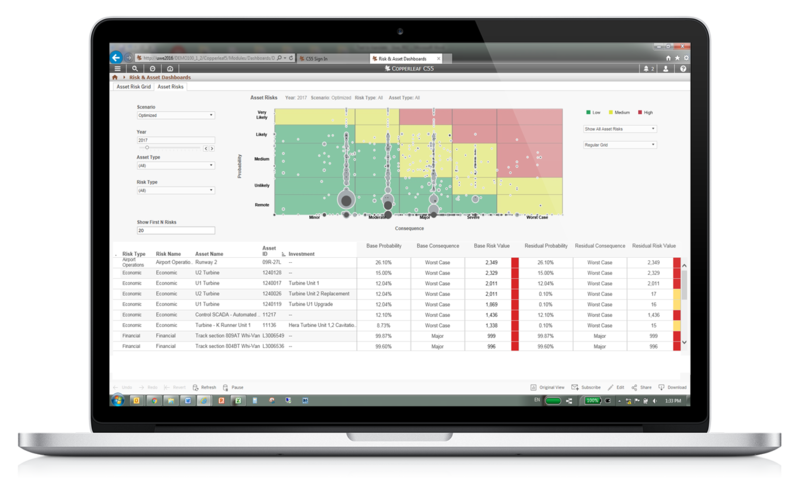 Improve the efficiency & effectiveness of your planning processes. Make the highest value decisions and create the optimal investment strategy. Learn more about all of the modules and options that can be added to your C55 system.